Workstation Basic is the former name of Business Rules! Workstation Basic was created in 1981 by a small group of programmers, to run programs on PCs that were originally written to run on mainframes in the old IBM System/23 Basic language. Workstation Basic is still maintained and supported today, under the name of Business Rules! (abbreviated as BR). The latest versions of Business Rules can still run the earliest IBM System/23 programs today, on modern operating systems, in network environments, with full support for modern printers and even Web Applications. If you have old software that runs in Workstation Basic and you're looking for more information about it, or what you can do to support and improve it, or want to run your programs on modern computers, operating systems and on modern printers, you've come to the right place. Business Rules today is maintained and supported by Business Rules Corp, owned and operated by one of the original creators of the language in 1981. Sage AX enables people to bring their Workstation Basic software into the 21st century, including more intuitive controls, faster screen design and modern report design. If you need help with programs that run in Workstation Basic, Sage AX can help. 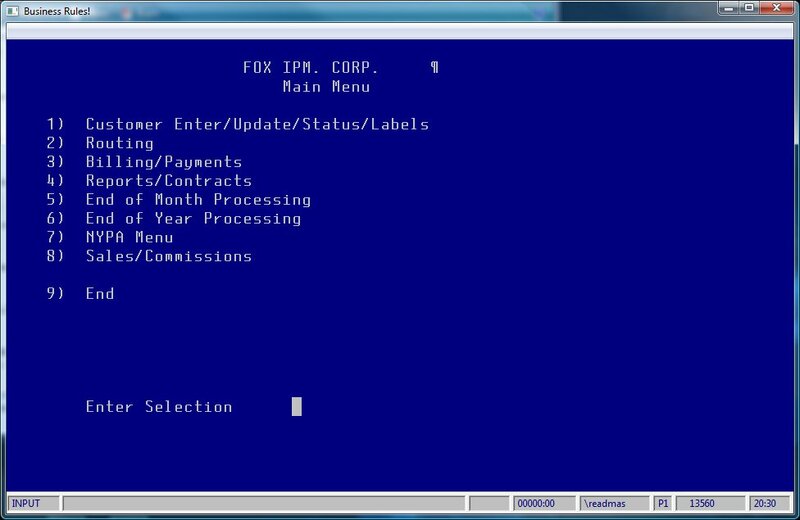 If you have old Workstation Basic software, it will likely utilize only a few colors and be entirely text based. Depending on the version of Workstation Basic you're running under, you may see something similar to the following license screens on startup. Below that, we have some pictures of older Workstation Basic software. Every program is written individually, and each program is unique, so I do not know what your programs look like. But here we have a few examples. While the colors and text and graphics and screen design won't match yours, the general graphics capabilities probably will.